Before Caemon’s diagnosis, our little family’s community circle was fairly small. We had close family, a few new friends and colleagues, and a number of friends hours away. As fairly recent transplants to our city, we were still finding our tribe. When Caemon’s illness hit and we learned how very sick he was, we were certain that it was going to sink us. 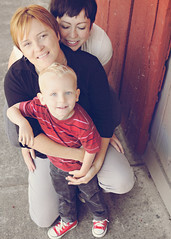 We had health insurance, but this meant Jodi had to continue working, and it wasn’t going to cover everything. We didn’t know how we would keep our residence, how we would afford traveling to and from the city, eating out for every meal, managing all the daily expenses of living in the hospital. But more than that, we didn’t know how we would make it through emotionally. How does one handle day after day in the hospital, the very lonely road of being a parent of a child with cancer? Within just a day or two of his diagnosis, all of these uncertainties were put to rest. On the first day of Caemon’s diagnosis, my sister started us a Caring Bridge site, and our friend Carol set up our Facebook presence “Caring for Caemon.” We shared the news with family, with friends from our moms’ group, even with my mom blogger community, and suddenly offers for help and messages of support were overflowing our inboxes and phones. A blogger friend took over my blog for a time, leaving announcements there. She communicated with my sister who communicated with Carol, and they all coordinated to set up fundraising and news dissemination and support. Our moms’ group made up a schedule for caring for our house and cats, and just like that, we had little to worry about but our son. And for nearly six months, that community support just kept growing. Our neighbors kept our yard up. The circle of moms did our laundry, cleaned our house, cared for our cats. Blogger friends started a t-shirt fundraiser. Carol put together a wine country gift basket raffle. The moms organized a huge event, raising money and celebrating us. Donations came in daily to help us stay afloat such that I was able to take leave from work. Messages of support from family, friends, and strangers popped up in our inboxes on Facebook. A few people set up regular visits to keep us company, to give us respite. An engine company from the San Francisco Fire Department, one of whom is a close friend of my brother’s, came to see Caemon with gifts and donations and words of encouragement. Our local fire department dropped off presents, even brought their engines over for Caemon’s third—and last—birthday celebration. To list every kind thing that happened to us just in that first ten days of learning our son had a life-threatening disease could take me days. To list the acts of kindness and compassion that came in the coming months, even in the last two years, would take weeks, months. The picture is clear though: from our son’s illness, a community of compassion sprung up, and it grew, and it grew. To say that this has been humbling is an understatement. I never imagined that over a thousand people would subscribe to a blog about my son, that over two thousand people would follow a Facebook page dedicated to him. And I never imagined what those people—most of whom I’ve never met—might do. From buying t-shirts and making donations to help us out to posting photographs of appliances and lit candles and sunrises to keep our spirits up, sending words of hope and inspiration, and later, when Caemon died, message after message after message of heartbreak and condolence. Members of our community helped our Leukemia and Lymphoma Society Light the Night team raise thousands of dollars and continue to donate to our St. Baldrick’s fundraising efforts; they have donated hundreds of books to our C is for Crocodile book drive; they have given blood and signed up to be bone marrow donors. At least one member of our community has become a bone marrow donor. Our community raised money for a bench for Caemon, and that same community sends photos of their children visiting the bench. This community wears their “Taking a CHOMP out of leukemia” shirts with pride and meet one another in unexpected places—as far away as Brooklyn. And our community has come together to help other families fighting the battle with pediatric cancer, making donations, offering support, spreading compassion. And do you know, our community continues to grow? New people join the Facebook page every week. New people follow the blog every day—people who learn of Caemon’s story and go on to think a little differently about their own lives and what they bring to the world, people who remember our golden-haired boy and keep his legacy alive in so many ways. This community with its remarkable wingspan has held our family up during the most difficult time in our lives, and it just continues to give and give and give. For our little boy with his tight circle of friends and family to draw thousands of people together for good is nothing short of beautiful, and a simple “thank you” will never be enough to express the gratitude we feel for all of you who are the living, breathing envoys of Caemon’s legacy. This entry was posted in Uncategorized and tagged a child's legacy, bereaved parents, Caemon, Caemon's Legacy, Caring for Caemon, childhood cancer, JMML on March 18, 2015 by T.
My Facebook feed is filled this week with children starting their first days of kindergarten and parents saddened to see their children growing up. There is talk in the air of tearful drop-offs and what to put in lunchboxes. I have seen this week parents with excited children in stores with lists of school supplies gathering crayons and scissors and paper, new school clothes, all the things one needs to have a successful start. They’re all nervous, excited. I stand back and watch or scroll through the pictures, my stomach knotted, my eyes welling, my heart aching. Caemon should have started school this year. Caemon never really got a chance to go to school. No, that’s not true. 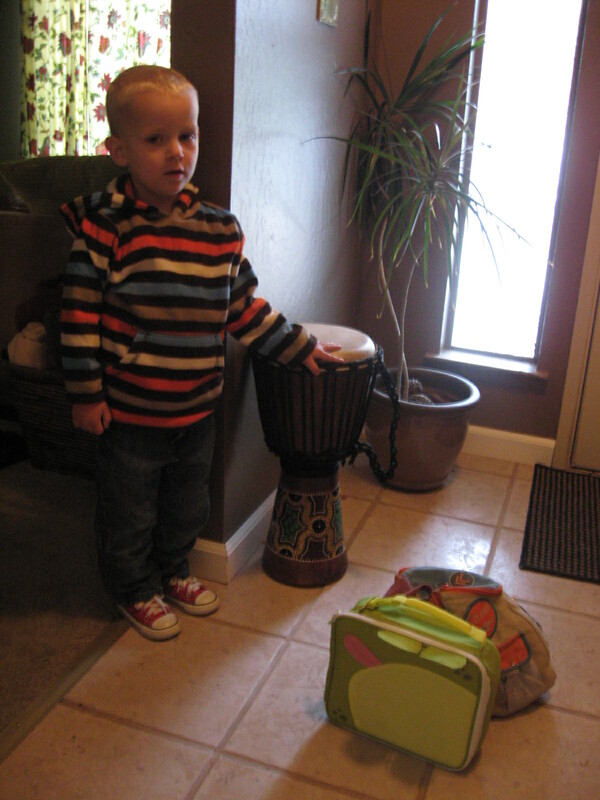 Caemon went to exactly two days of preschool at a wonderful Montessori school near the university where we teach. He had been going with Jodi for a few weeks to become acclimated, and then the week before his diagnosis, we had two days of drop-offs where Caemon went to school with the other kids and without his moms. We each dropped him off once. We both got to pick him up. I remember watching him before he knew I had arrived, seeing him earnestly helping with lunch cleanup. He was cooperating with the other children, looking so grown up, so capable. Both days, he came home with art projects. He ate all of his lunch. He liked his teachers. He knew the other kids’ names and talked about them. But then leukemia struck, and he never went back. There are many things my son never did, and this becomes more apparent the more we are around the children who were close to Caemon’s age. We have friends whose children began writing letters and soon words when they were three, and watching these children develop written language skills has been surprisingly emotional and bittersweet. Caemon never learned to write. He didn’t write a single letter. Caemon never learned to jump. He never wrote his name. He never drew stick figures. He never rode a bike. And when I think about these classic milestones that Caemon didn’t cross, I sometimes start to worry that somehow, my brilliant boy was falling behind, that he didn’t accomplish what he should have by the age of three years and five months. It’s natural for parents to worry about such things, but it does so little good, particularly when the child is no longer here. Beyond the worry, though, is sadness, a devastation that my son died before he got a chance to do all of these things, before he got a chance to be a normal kid. The one message that keeps coming back to me each time I face this regret that he some how missed out is this: He didn’t have time. Caemon had other things to do. He learned how to give warm, strong hugs to people he loved. He learned to say, “Excuse me; I have something to say,” when the adults in the room droned on and on. He learned to tell a story. He learned to memorize book after book after book and recite them word for word. He learned to swallow a pill with ice cream. He learned to make ice cream. He learned to blow kisses and to receive blown kisses and tuck them into his shirt. He learned to use “who” and “whom” correctly (although we never once mentioned this or corrected him in this particular usage). He learned how to help other children who were also sick. He learned to gently pet a cat. He learned to make muffins, how to level a teaspoon of baking soda, and that the best part of baking is licking the remaining batter from the bowl. He learned how much patience it takes to wait for anything delicious to bake, and that time always passes more quickly with snuggles and tickles. He learned to plant seeds and bulbs. He learned when to pick a tomato and a pea, and he learned just how delicious food is when we grow it and make it ourselves. He learned to hug trees. He learned to program an IV pump, to flush a line, to administer chemotherapy, to ask for a bolus, to sit very still for procedures, to breathe through pain. He learned to say, “I love you” when he meant it. This list could be miles long. Caemon learned so much in his short life. He was so busy doing what he wanted to do, learning what he was ready to learn, that no, he didn’t have time for jumping and writing, but he did have time for compassion, for communicating, for nurturing, for connecting with other people (and machines). Caemon didn’t need to learn to write. He could speak (very well), and that is all he needed to communicate. He didn’t need to jump; he could run around just fine when he wanted to. He didn’t need school because his curiosity kept him learning constantly, yes, even in his hospital bed. Of course it hurts that we have no child’s lunchbox in our home, no first-day-of-school picture to post, no teacher conferences or back to school nights and no “To Mommy” notes scrawled in an early writer’s hand. It’s impossibly painful and poignant that the art Caemon made in his three years and five months is all we’ll ever get from him, that his favorite books sit dusty on a shelf. I can take some comfort, however, in knowing what he could do, what he did do, and knowing how much of himself he left behind. My son never wrote his name, but he touched the hearts of thousands of people, reminded us to live, taught us to love more and fear less. How could I ask more of him when he gave so very much? Caemon’s first day of preschool. This entry was posted in a developing mind and tagged a child's legacy, Caemon, childhood cancer, childhood leukemia, grieving a child on September 2, 2014 by T.
It has been a bit too long since I last posted, but this is due in large part to the fact that we are starting to be very busy with our work to honor Caemon’s legacy. I would like to share some of our activities and planning with you. First and foremost, we decided on a name for our organization. After seeing so many wonderful recommendations and then seeing some variations on the blog title, it occurred to Jodi and I that C is for Crocodile is the perfect name for our organization, and variations on the title allow us to title different areas of our work under subtitles like “C is for Caring” and “C is for Cure.” We have secured a post office box and have a tiny little savings account designated for this purpose. Now we are working on our 501(c) (nonprofit) status so that we can put everything in the organization’s name. Webpage/Graphic Design: If you are a web designer or graphic designer and want some pro bono work, we would like to put together a nice, shiny website that can serve as a hub for all of our activity. We have already secured cisforcrocodile.org. If you are interested in helping us put this together, please contact us at cisforcrocodile@gmail.com. Fundraisers: After you read everything below, you’re going to see that we’ll need some money to carry all of this out. If you have ideas for a fundraiser or would like to hold one, great! At present, there is a fundraiser happening via two lovely Caemon supporters. They are holding a Pampered Chef event through which they are donating all commission made from purchases to C is for Crocodile. You can visit the event here: http://new.pamperedchef.com/pws/consultantheather/guest-landing/8835923524763. Purchases made via the event site through July 31st will benefit C is for Crocodile. 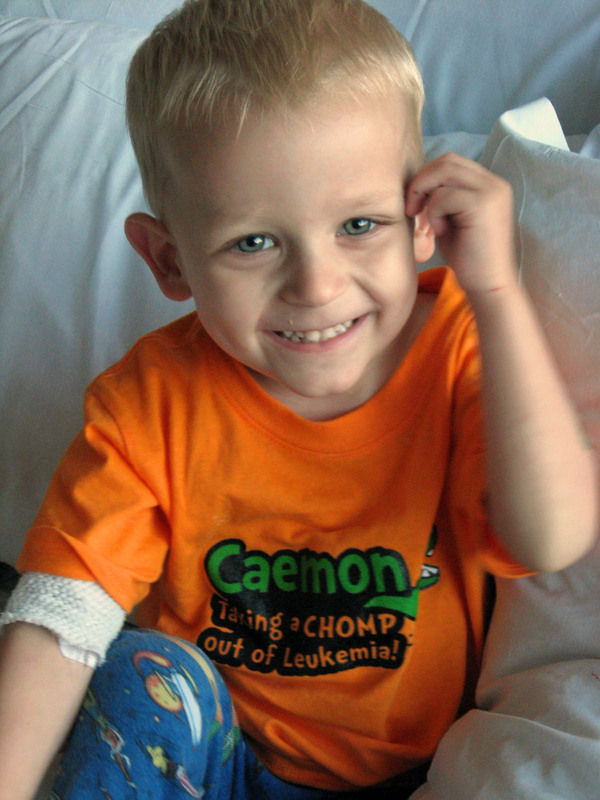 Throughout Caemon’s treatment, he was the recipient of so much generosity. AT UCSF, toys and stuffed animals came through on a regular basis, and while the playroom had books the kids could borrow, there just weren’t a lot of books coming in on the big gift carts. Because Caemon loved reading so much, and because we value it so much as well, we have started a children’s book drive, which we will hold annually. We are collecting new books for kids from infants to young adults. Once collected, we will distribute these to pediatric oncology units in California hospitals. Donate books! We are asking for children’s books of all kinds–probably even a few grown-up novels appropriate for kids in their upper teens. You can send them to our post office box: Marston-Simmons, P.O. Box 9214, Santa Rosa, CA 95405. If instead you would prefer to send a gift card from our local bookstore, you can go to http://copperfieldsbooks.com/gift-cards, or from a larger chain bookstore here: http://www.barnesandnoble.com/u/gift-card/379003883. With these, we can go pick out books to fill in any age gaps where we may be missing books. If you choose to send an e-gift card, just use the cisforcrocodile@gmail.com address. We will keep this going until we have enough books to distribute. Ideally, we’ll get these out in the fall. Light the Night is an annual fundraising event held by the Leukemia and Lymphoma Society (LLS). This organization provided us with support from a number of different angles during Caemon’s illness, and they directly fund research conducted by Caemon’s doctors. The Light the Night walk is held each fall in cities all around the country. Team members each raise at least one hundred dollars and then join their team for a night-time stroll with illuminated balloons. At this year’s North Bay Light the Night walk, Caemon will be the Remembered Hero and will thus receive special recognition. We will be walking both here in Santa Rosa and in San Francisco. We may also have the very exciting opportunity to donate our funds directly to a researcher. More on this will come later. In fact, we are meeting today with LLS to learn about possibilities for Caemon’s legacy through this organization. Join and Walk: If you are local, and you would like to join our Santa Rosa team, you can join here: http://pages.lightthenight.org/2013/teamcaemon. You needn’t be an athlete to participate; you only need to be able to ambulate slowly for a couple of hours with lots of other really great people. Lead a Team: We are also looking for people to head up Team Caemons in their areas. Being a team captain is very little work (it involved a bit of motivating, some emails–about as much as you want it to involve), but it allows us to spread our efforts to cities all over the country. If you think you might want to start up a Team Caemon in your city, you can also visit this page: http://pages.lightthenight.org/2013/teamcaemon, and click on the link for starting a team in your area. Then, let us know you’ve started one. More immediately, if you are in or near San Francisco, and you would like to captain that team, we need a team set up there as soon as possible. Donate: Of course, if you can’t join one of our teams, you can also make a donation to Team Caemon. Use the links above to visit the national Team Caemon page, and click on any team member’s name to make a donation. We also have a national Team Caemon for the LLS Team in Training. If you are an athlete, or would like the support to be one, you can join Bree Davidson and others in this effort. Visit the Facebook page here: https://www.facebook.com/TeamCaemon. Children are diagnosed with cancer every day, and, according to the NIH, about a third of those diagnoses are leukemia. We would like to be able to send care packages to families undergoing a recent diagnosis of rare leukemia, particularly JMML. We won’t be able to send care packages to every family at this point, but given that there are under 50 diagnoses of JMML annually in the United States, this is something we feel we can do. If you have heard of a child recently diagnosed with JMML, please send their families our email address, or send us some contact information, and we will send out a care package. Eventually, we will put out lists of items that can be donated for care packages, and we will also have fundraising efforts to support this. If you have ideas about this, feel free to contact us at cisforcrocodile@gmail.com. Caemon Movie: We would like to work with a filmmaker to develop an educational film for those in the medical profession about the importance of medical play. We have a number of video clips of Caemon’s medical play as well as access to his providers who saw directly how his fascination with medical play assisted him through what can be a fairly traumatic experience for a young child. If you are a filmmaker or know someone who would be willing to donate time for this project, please let us know. And obviously, the book: I have dreams of turning much of what I have written into a book. People have been suggesting this since early on in Caemon’s illness and I certainly feel a book in this. If you’ve got connections in the publishing industry who might be interested, send them my way (I’m not interested at this time in self-publishing). Your ideas: Of course, I’m sure there are other ideas out there, and we will certainly be working on all of this over time. If you have a project or suggestion you would like to offer for carrying on Caemon’s legacy–or if you have done something on your own, please let us know. We would love to hear from you. Thank you to everyone who has worked on these projects with us thus far. We look forward to building our organization knowing we already have so many wonderful supporters out there. This entry was posted in C is for Crocodile, Caemon's legacy, community, JMML, life after Caemon and tagged a child's legacy, childhood cancer, JMML, leukemia, nonprofits on July 16, 2013 by T.